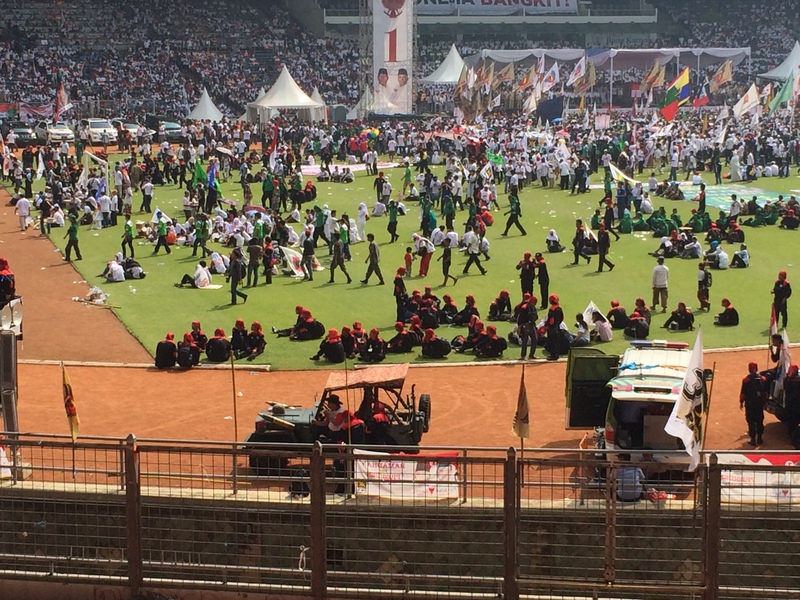 At the invitation of the good folks over at New Mandala Indonesia, I spent the afternoon today at a Prabowo rally at Bung Karno Stadium in central Jakarta. It was technically a worker’s rally but it’s pretty clear that most people who were there had been paid to attend. Having no idea what to expect, I was surprised by a couple of things. First, by the size of the venue. Second, by the “family-afternoon-activity” feel of the thing. Third, by what messages actually resonated with the people who were paying attention when Prabowo gave his speech. Some of the many busses used to transport attendees to the rally. I took a video of the band processing into the venue. The MC was going on about the koalisi merah-putih [= red and while coalition] that supported Prabowo, and about all of the groups in Indonesian society (workers, farmers, laborers, etc.) from the entire archipelago who were coming together. I sense they were going for Triumph of the Will, but got something closer to a mix between high school marching band competition and monster truck rally. The video also gives us a sense of the size of the venue. 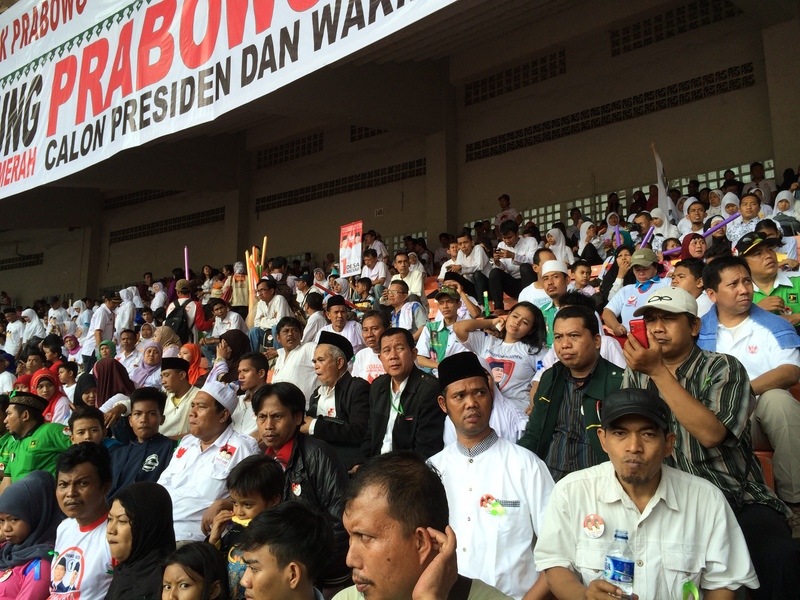 During his speech, Prabowo alleged that there were 230,000 people in attendance. I’d put the number closer to 40-50,000. 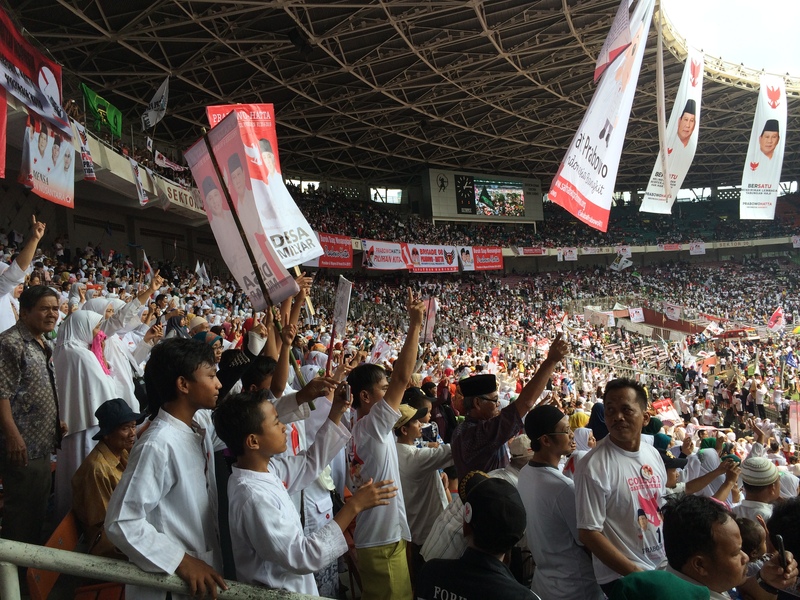 Most of the people around us were in PKS gear, although most also had put on their free “Prabowo – Hatta No 1” t-shirt. 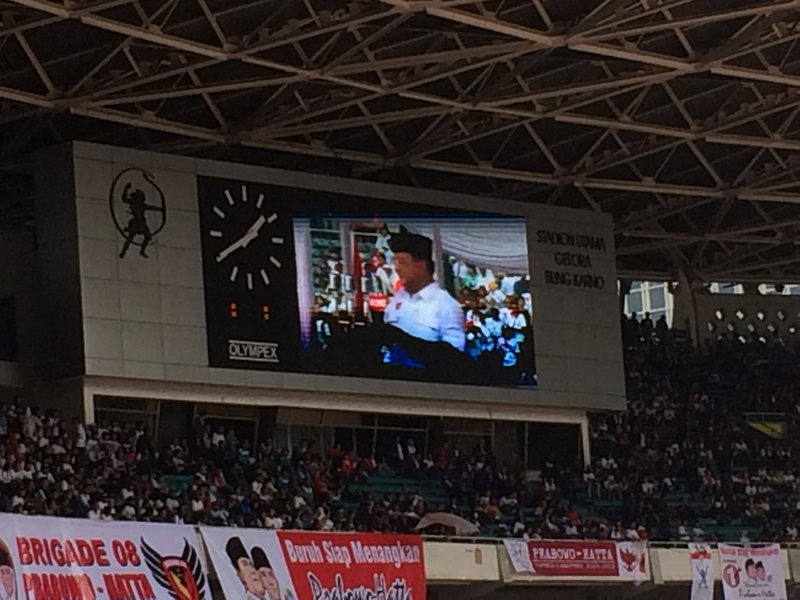 I also took a video of the national anthem being sung, featuring the proud young Prabowo supporter next to me. 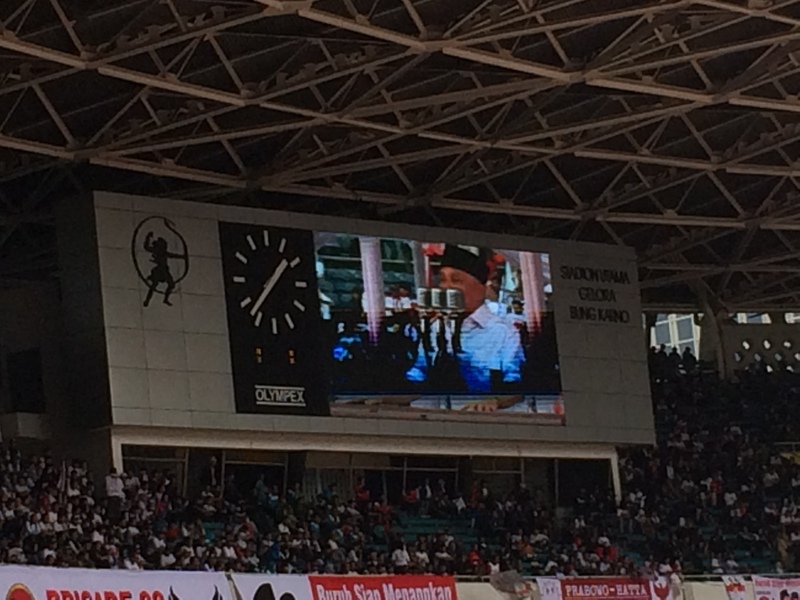 This is actually not just constructed political theatre; Indonesians know their national anthem and are proud to sing it, in the same way that Americans will reflexively sing the national anthem when they hear it. The rest of the event, though, not so much. After an introduction to the heads of all of the main political parties supporting Prabowo’s campaign—all of whom, experts say, Prabowo truly detests—we got to the main act, a short speech by Hatta Rajasa and a longer one by Prabowo. Pretty interesting stuff. My ANU colleagues report that Prabowo’s remarks were the standard campaign speech, with the new twist that this time Prabowo claimed to come from a modest background, so modest that sometimes he wondered where his next meal would come from (in reality…). 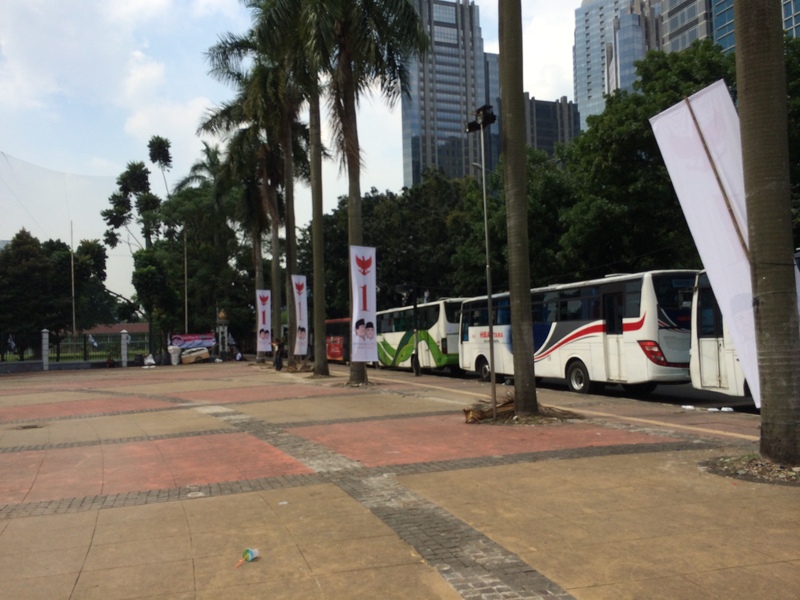 Despite Prabowo’s spirited oration, though, the attendees weren’t much interested. A good majority of the people walked out of the stadium in the middle of the speech. Amidst the general non-interest displayed by most attendees, it’s interesting to note the few things that Prabowo said that did get their attention. Introducing Titiek Soeharto, his ex-wife. Introducing Ahmad Dhani and Rhoma Irama, two of his biggest pop culture supporters. Announcing his support for the workers. The rest of his material didn’t seem to inspire much of a reaction from those in attendance.